Updated all Aweber email messages that Jomvie has proofread and implemented all his proposed fixes. Implemented all proofread changes to Truth or Dare Story page. Please have a review of it. Also Implemented all proofread changes to What is Outsourcing page. Please have a review of it. Turned more Infographic reading material and SBI! forum posts into offline articles and saved to Jomvie's low priority folder. Also created basic instructions for this task and shared with Jomvie. 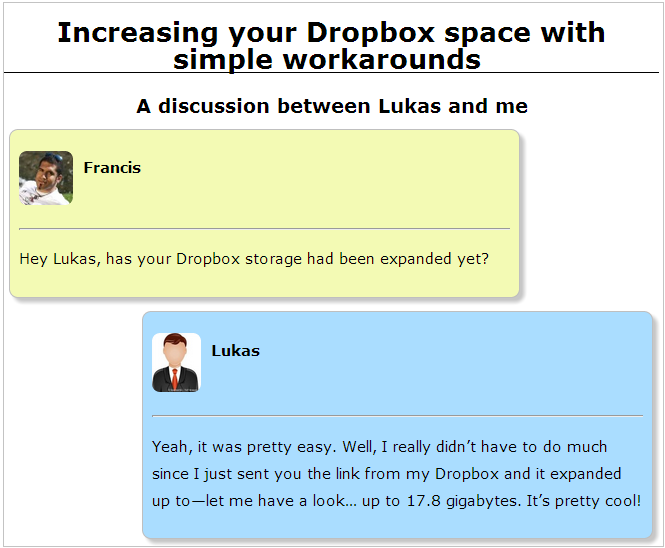 Uploaded "How to increase Dropbox space" (Interview between you and Lukas) to Ideal-helper as a tier page. The page is saved as a draft, Analyze report was not okay and had a lot of issues. please have a review of it. Reworked instructions for 'Sotam and Site info' task (Initially we planned to start this project with Denise), put together all files and videos and sent to Jomvie's low priority folder. Created basic instructions for podcast creation and upload all files to Jomvie's low priority folder. Created a Tier page draft for 'about-me' page and inserted both said images within it. Started reviewing long interview between you and Eric and have started dividing it into various topics, but could not finish it today. The document still needs a lot of formatting and cleaning up, so it will take a bit of time. Distributed more pages on RSS feed.